After its launch yesterday, the Dragon capsule is now on its way to the International Space Station. 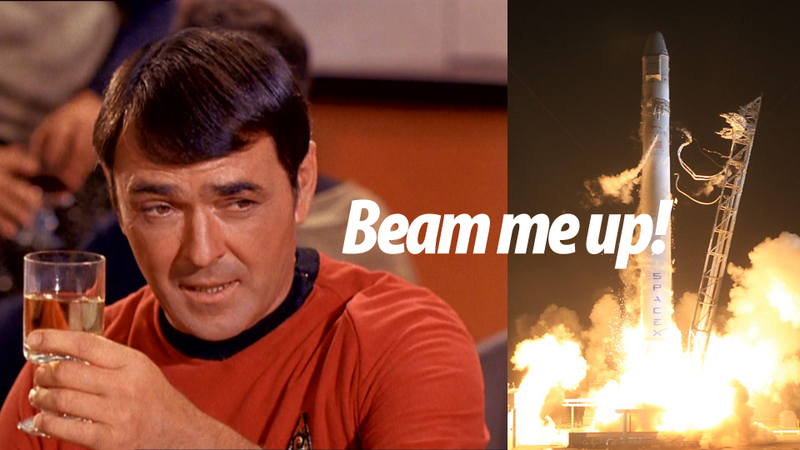 But the Falcon 9 rocket carried something else too: the ashes of James Doohan, the actor who played Scotty in Star Trek. His ashes were in the second stage of the Falcon 9 rocket, which separated from the capsule nine minutes and 49 seconds after the launch. The ashes canister is now in orbit alongside Gordon Cooper. He was one of the original Mercury Seven, the first astronauts in the history of American spaceflight. The guys with The Right Stuff. Cooper was the first American to sleep in orbit and the last American astronaut to be in orbit on his own. He was also part of the Gemini Project but didn't make it into Apollo.